AU summit 32: Big powers back on the Peace and Security Council? 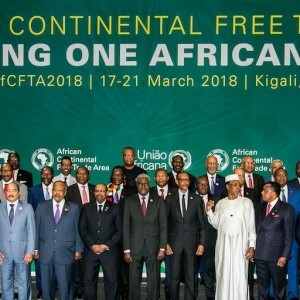 The African Continental Free Trade Area (AfCFTA) is a remarkable achievement, the United Nations Conference on Trade and Development (UNCTAD) enthuses. ‘At a time when trade is questioned in some parts of the world,’ African leaders have taken a ‘bold step in favour of trade and of the economic integration of the continent’, it notes. UNCTAD believes this free trade area could boost intra-African trade by 33%. Albert Muchanga, the African Union’s (AU) Commissioner for Trade and Industry, is equally optimistic. At least 19 AU member states will have deposited their instruments of ratification with the AU Commission by the end of the AU summit in Addis Ababa this week, he says. One of those will be South Africa, which has already ratified the treaty through Parliament. But President Cyril Ramaphosa wants to personally deposit the instrument of ratification at the summit to show the importance Pretoria places on the agreement, says Muchanga. Nineteen will be just three short of the 22 ratifications needed to bring the AfCFTA into force. Muchanga confidently predicted to ISS Today that those extra ratifications would be done by July at the latest, allowing for the ‘launch’ of the free trade area at a special AU summit in Niamey in July. That would however be the second launch of the AfCFTA. The first was in Kigali last March when 44 AU members showed their in-principle support by signing the agreement. Another five have since signed. Given all the pomp and ceremony, it’s necessary to caution that no goods will cross any border duty-free under the agreement for some time to come. This is mainly because the AU took the unusual step of launching – and now relaunching – the agreement before the crucial schedules on scrapping import tariffs had been agreed. Muchanga remains optimistic, however, insisting that negotiations on rules of origin are 80% complete and will be done by June. But he doesn’t put a date on the completion of the real nitty-gritty in this as in any free trade agreement – negotiations for Protocols on Trade in Goods and Trade in Services. These determine precisely which imports countries will let in duty-free and which not. The framework agreement requires them to liberalise 90% of trade, allowing them to exempt 10%. UNCTAD has cautioned that with levels of intra-Africa trade generally so low anyway, it is theoretically possible to exempt almost all trade between certain countries and still be compliant with the letter, though certainly not the spirit, of the AfCFTA. Aware of this problem, AU trade ministers meeting in Cairo in December agreed that products to be excluded from liberalisation may represent no more than 3% of tariff lines, accounting for no more than 10% of the value of imports from other African countries. The overall 10% exemption also includes sensitive products that will be liberalised over 10 years for Africa’s 21 developing countries and 13 years for the 33 least developing countries. The trade ministers also agreed that countries should be given until January 2020 to adopt their negotiated market access offers, and that rules of origin must be agreed by June this year. The negotiations over these rules are difficult and critical though. On the one hand they can be too strict, and a country can use them as a protectionist instrument by insisting that all or nearly all the inputs into African goods they import must be made in Africa. On the other hand, some countries – and South Africa is evidently among them – fear that if the rules are too lenient, China for example could channel a flood of clothes into Africa just by adding a few buttons to them on the continent and calling them African goods. There is also still some concern about the participation of bigger economies. South Africa, Kenya and Ethiopia are in. Nigeria so far is not, although Muchanga believes it will be soon. He says the Manufacturers Association of Nigeria, which initially spearheaded opposition to the AfCFTA, is now in favour of it. Egypt, which this year chairs the AU, has also not ratified, although it is expected to. Is there cause for concern? Trade negotiations inevitably take longer than originally planned. It is no doubt because of the lack of implementation of past agreements that the AU – under the assertive direction of Rwandan president and AU chairperson Paul Kagame – rushed to launch the AfCFTA in March last year, and has been cracking the whip ever since. This political pressure is maintaining the momentum of the remaining negotiations. And the eventual prize could be significant. UNCTAD estimates that full liberalisation – 100% liberalisation of tariffs on trade in goods – would boost intra-African exports by 33% in value over the transition period. These goods are now worth about US$62 million, representing about 18% of total exports. Most African countries’ GDPs would rise by 1% to 3% and total African employment would rise by 1.2%. If traders and investors don’t reap the promised benefits and begin to suspect they have been sold a political project with little concrete value, this will undermine the AfCFTA’s legitimacy – and the whole notion of free trade. That comes with a price, in large lost customs revenues and business lost to competitors. The compensating benefits must also be large and real. This is the fifth in a series of articles focusing on the African Union summit which starts this week. The 2019 AU theme focuses on finding solutions to forced displacement in Africa.